When I set out to do one race per month this year, I had trouble coming up with a February race. There isn’t a Valentine’s themed race in my area, so I was at a loss for which one to pick. Luckily our local track club puts together a 10k/half marathon race in a neighboring town. After convincing my friend Robyn to do the 5k with me, I signed up and added it to the calendar. I’ve only ever done one 10k and it only had 6o people running it so I was up for a new experience outside of my comfort zone. On race day we met up with Robyn and basically just hung out until the race started. Robyn and I milled in towards the back and waited for the gun to go off. I knew that I wasn’t going to have a stellar race since I haven’t been running very much, but I did know that anything faster than my first (and only) 10k would be totally acceptable to me. The course was an out and back so I was able to gauge where I was at by the number of runners passing me on the opposite side. The first mile or so was torture. My legs were tight, my lungs were on fire, and I just couldn’t find a groove. Sometime around mile 2 I found my happy place and ran strong when I could but still took walk breaks. Everyone who ran past me headed back to the finish line looked strong and I made sure to tell them good job. I felt proud and strong until I hit the 5 mile mark. The man standing by the mile marker had a stopwatch and was calling out times as people reached him. I passed him at 60 minutes on the dot. That was okay with me and I was pleased with my effort. At that point, it was a sure PR for me and that made me happy. My legs didn’t feel as great as they had earlier, but I was trucking right along and walked until I could see the finish line. I was able to kick it in and look strong for the finish. I finished with a solid time of 1:13:13. Over an 11 minute PR for me from my first 10k. I”ll take it. I thought having two 13s in my time was a sign that good things were headed my way for 2013. After finishing and getting a big hug from a former track club president, I found my man and got a big old sweaty kiss. Cheesy, right? My main focus was to get water and to sit down. We were able to chill for a quick bit before heading back out to watch Robyn kill it and meet her goal time by over 3 minutes! 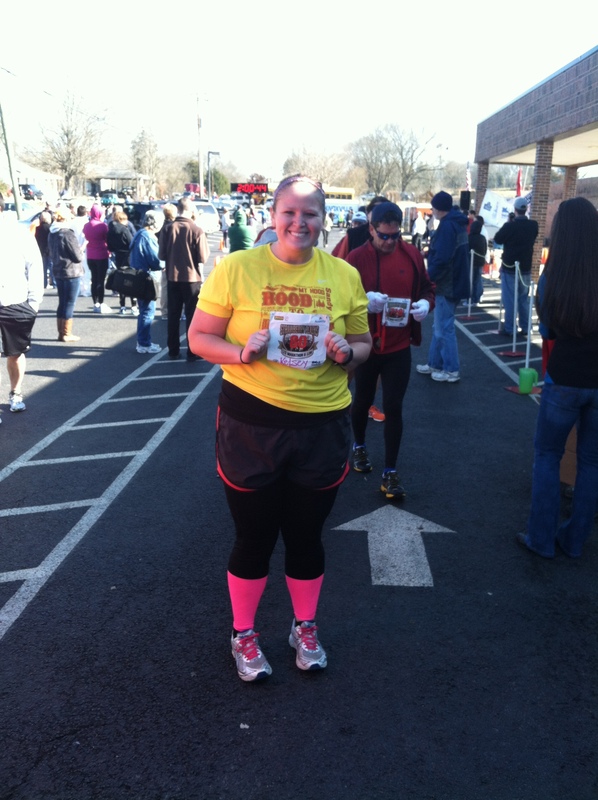 So proud of her and everyone else who met their goals at the race. It was a great race and I was so thankful to have done it, to have my friends do it, and to have someone cheering for me at the finish line. It wasn’t my best effort and I was not trained for it, but I’ll take an 11 minute PR any day. This entry was posted in Race Recaps, Running and tagged 10k, fat girl running, fun race, no training, personal record, race recap, strawberry plains race by thegogirlblog. Bookmark the permalink. Great job! I’m gearing up to run my first 10k in a few weeks. Thanks for the inspiration! No, YOU are my inspiration. You have done so well! Just commented on your blog…you were totally Olympic. 13 is most certainly a lucky number! Keep up the good work! Congrats on the PR! AWESOME! Great 10K time, too, if I may say so myself.